Seventh-grade materials consist of 100 Bible-story centered topical lessons that explore biblical themes and key Christian concepts. Each lesson is designed to be taught in 35–45 minutes. One in Christ Grade 7 teaching materials are arranged in nine units, each with its own theme, worship suggestions, bulletin board, and mission story. Each lesson contains a lesson plan with background information, a classroom devotion, the main theme, lesson objectives, Law & Gospel points, and a materials listing. Grade 7 Student Book. This colorful discussion guide has two pages per lesson. Activities include study of God’s Word, daily activities, memory verses and life-application stories that give students an opportunity to reflect and respond to the lesson. 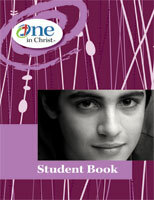 Concordia’s Complete Bible Handbook for Students. This detailed book provides background information about important people, significant places, customs, traditions, and life in biblical times. The handbook uses articles, charts, diagrams, genealogies, illustrations, maps, outlines, overviews, and timelines to provide details that can be added to daily lessons. Unit Bulletin Board Sets. Each of the nine units includes its own bulletin board to help teachers visually reinforce unit themes and lessons. This detailed book provides background information about important people, significant places, customs, traditions, and life in biblical times. The handbook uses articles, charts, diagrams, genealogies, illustrations, maps, outlines, overviews, and timelines to provide details that can be added to daily lessons. Lesson 42: How Did Jesus Serve as Both Priest and Sacrifice? Lesson 47: What Names do We Now Have in Christ and What Do They Mean for Us? Lesson 58: Why Do Worship Services Include Confession and Absolution? Lesson 96: How Can I Effectively Witness to My Friends and the Members of My Family?